My first ancient army was Airfix Romans and I notice their patchwork leather shorts are back in fashion! These were first unpainted and then with thinner plasticard shields added painted up. This force fought Ancient Britons, and even elves and goblins, with WRG Ancients 4th Edition rules. They were followed by a Republican army made by the long defunct Leviathan Miniatures. Nicely cast separate pila and well proportioned figures I enjoyed painting. Happily ignored by burglars but I sold them some years ago when moving. 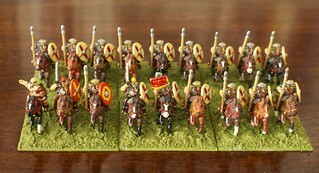 My current Romans are made by Martin Goddard at Peter Pig. I created a notionally Flavian army for Boudicca’s revolt but now plan to use them back to the early first century AD. This is based on the finds at Kalkreise which show frontier troops using lorica segmentata armour earlier than previously thought. 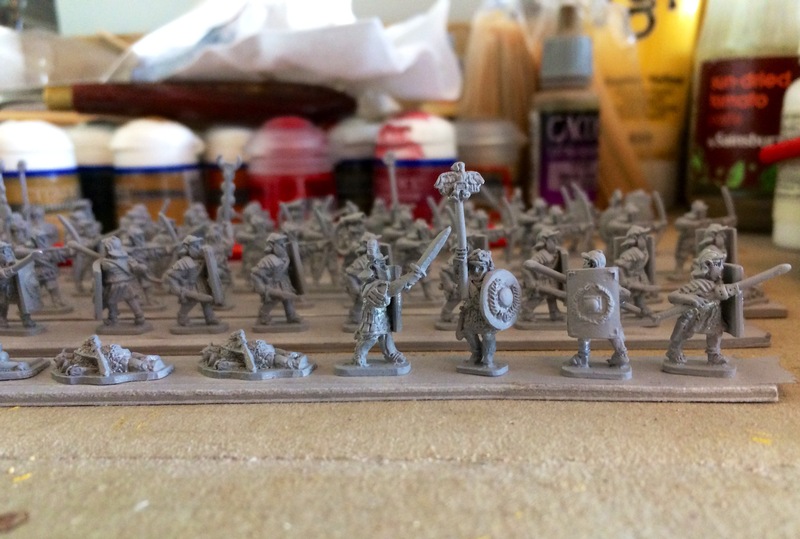 This army was created based on the DBM rules and suggested forces in Roman Britain. It was painted while I was working in Bath and couldn’t afford to go out every evening in the late 1990s. Over time I have decided to concentrate on 15mm for ancient games as described in a previous post on the British opposition for this army. So this army is overdue a refresh. I’m simply bringing small groups of figures into larger groups to tie in with Field of Glory. Having more Romans is a pleasure in itself too! Working amongst the Roman collection in Exeter Museum has also re-awoken my enthusiasm for this period of Devon and Britain’s history. Plus recent Osprey books on this period including Boudica’s Revolt and the Teutoburger Wald coupled with reading some historical fiction by Simon Scarrow and Lindsay Davis. The first batch of figures are under coated and ready for painting on the work bench. I’m glad I kept colour notes to help them blend in with my existing figures!